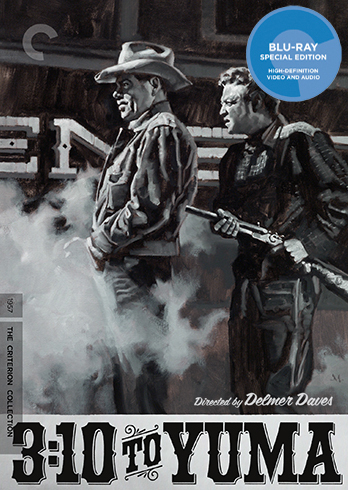 Aaron West discusses the second in the Delmer Daves, Glenn Ford trilogy, which could be considered a “Western Noir” because of the clever shot selection, the use of light and shadow, and the multifaceted characters. Posted on November 25, 2015, in Criterions, Film, Podcast. Bookmark the permalink. 4 Comments. Aaron, I loved your analysis of this film, which is one of my all-time favorites. Glenn Ford is mesmerizing in this role, and the film needs a solid actor like Van Heflin to not be swallowed up by him. Yup, I agree: definitely a western noir. I didn’t realize Glenn Ford liked to trim his lines. I will keep that in mind the next time I watch one of his films. This one has been sitting on the shelf for a long time and finally glad I watched it. I thought it was a little slow in the middle, but the final walk to the train was intense. Ford and Heflin were such strong leads. It has been a while since I watched the remake, but I need to revisit. Another good podcast!